A mile in these shoes? Everyone has a story about how they got where they are, and probably even have some mementos that they’ve collected over the years. 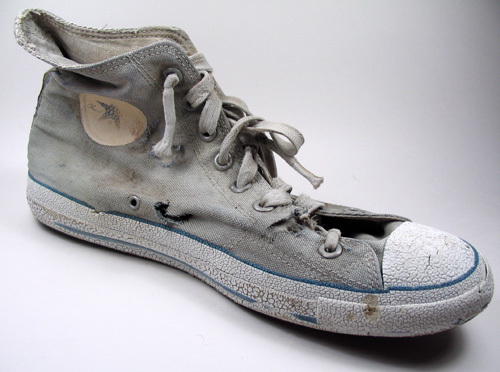 Mine includes this ratty old Converse high-top. I keep it with me as a reminder of where I have been and what I’ve learned along the way. I first saw this shoe during my second season working at Canobie Lake Park. It was dark blue and looked as if it had just come out of the box. 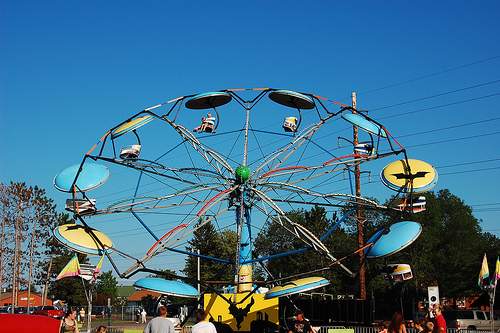 I was running a ride called the Paratrooper (like the picture below) and it was close to closing time. I happened to notice one exuberant youth who was actively kicking his feet back and forth – almost as if he was trying to kick his shoes off. I started to bring the ride down, and the next time he came around I noticed that he was missing his left shoe. He hobbled over to me when the ride stopped. “But dude, my Mom is going to kill me if I don’t come home with both shoes – she just bought them today!” And then it happened… I heard myself turn into my Dad. “Maybe you should have thought of that before you tried to kick it off your foot”, I snickered. It became part of my collection when a friend that works in maintenance called and said they were cutting the branches back and the shoe would likely be coming down. Of course I ran down there as fast as I could and got the shoe. It has been with me ever since… in every office, cubicle, or workspace I have inhabited. Over the last 20 years, looking at the shoe has reminded me not to take myself too seriously and that at some point, like it or not, we will all turn into our parents. What’s your story? Click here to share! Everyone says to be successful you need to think big. Big ideas, big plans, big investment. My wife, in fact, has been heard saying many times, “go big or go home”. While I think there is some merit to thinking big, I’m not so sure we all wouldn’t benefit from thinking small from time to time. When was the last time someone thanked you for your efforts, acknowledged your progress or just realized you were still alive? When we think about how we interact with one another, it’s those small things that get overlooked – and aren’t those really the things that keep us going? When people are asked about why they left a company, it’s not because the company executives didn’t produce enough big ideas, but more often because their direct supervisor did not make them feel valued. This could simply mean listening to people, asking their opinions and showing respect for their time. So when you think about your dreams – think big! When you think about your employees and other humans in general, think small. What small effort on your part would make a big difference to them? Click here for resources from “To Train or Not to Train” and “Sink or Swim”. It may be one of his most popular, but it was certainly not his first. It took a lot of work by a lot of talented people to write, record, produce and market this blockbuster success. 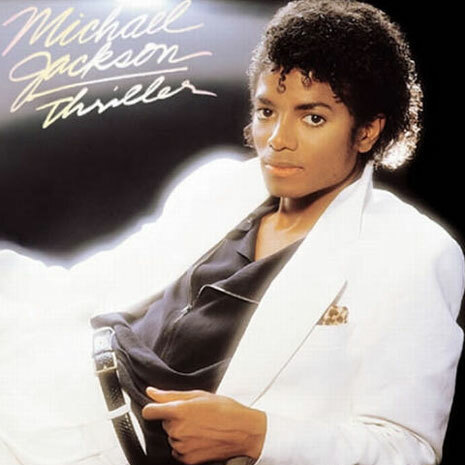 One story goes that he and producer Quincy Jones decided things weren’t quite right, so they took a week to rework and remix each song. What if they had given up after the first attempt? What if Michael decided he was done after the Jackson 5? This is unfortunately a common occurrence when feedback is given once and we don’t see an immediate improvement in the behavior. Or my favorite… someone is sent to a class in the hopes that it will fix the performance issues. Classes can be great (I teach a lot of them), but they can also be a crutch for people “too busy” (or unsure how) to give follow-up and continual feedback. Our solution? First be aware that one “talking to” does not automagically mean better performance. (How many things did you learn or remember after only hearing it once?) Next, be patient and prepared to explain your concepts in multiple ways. Last but not least, make sure you are as specific as possible with what you are telling people. Saying, “You have a bad attitude” 100 times doesn’t give them specific behaviors to work on. It is a nice piece of personal judgment that is sure to get you a little attitude in return. My wife Linda recently got a great book on networking called “How to Work a Room” by Susan RoAne. In it, Ms. RoAne outlines some great strategies for increasing your comfort level approaching strangers to increase business and social contacts. One of the “ah ha” moments for me was when I read the line that “only incompetent people think they know it all”. Wow. If I think about all the really smart people I know, none of them are afraid to admit when they are wrong or that they don’t know something. If I think about the other end of the spectrum, they are the ones who always have an answer – even if it is just a temporary measure to make themselves look good. I think that is another aspect… people who can admit that they are still learning are typically more confident in themselves and not concerned that others will look down on them for asking the question. When you see the ones who appear to be confident, probably coming off as cocky, they may actually be trying to make up for a lack of confidence in themselves. The moral of the story: don’t be afraid to admit that you don’t know what you don’t know. No one knows everything, and everyone knows something.